Of the Mario Kart series, Super Mario Kart is challenging, Mario Kart: Double Dash is different, and Mario Kart: Super Circuit is... well, it's portable. The word that always comes to mind for me regarding Mario Kart 64 is Relaxing. Now, that may sound a bit strange. Why would a racing game be thought of as relaxing? In the various Mario Kart games, there are a different variety of drivers you can choose from, who each have their own particular strengths and weaknesses. In this particular version, you can choose from: Mario, Luigi, Peach, Yoshi, Toad, Donkey Kong, Wario and Bowser. These characters fall into certain categories, with different traits to each. For instance, Donkey Kong, Wario and Bowser are all heavier characters. As such, they accelerate very slowly, but, once they get up to top speed, their weight builds into momentum, which makes for a very high top speed. Peach, Yoshi and Toad are light, and accelerate very quickly, but have a lower top speed. Mario and Luigi are just sort of in the middle of things, having a balance between the categories. So, it's up to you to find the driver who suits your style best, or the one who will handle a particular course best. Certain characters are going to handle and work better on different courses, but, all of them can do well with a good player behind them. 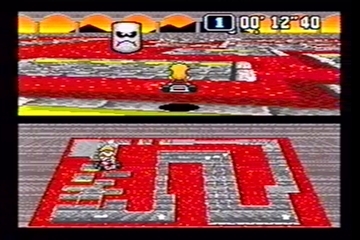 The game is made up of "Cups," which contain different tracks. In order to win each cup, you have to go through the tracks listed under each cup and come out with the highest overall point total. There are four tracks per cup, and four cups in the game, for a total of sixteen different tracks. These tracks vary from raceway-style courses, to a leisurely drive through a farm, to a haunted house, a castle filled with lava, or a road in the sky. This is definitely one of the game's high points, the variety in the tracks. It doesn't feel like you're just going over the same road a dozen times with different pictures around you, each track plays dramatically different, and each has their own style and ways that you can approach it. Blasting down straightaways might work fine when you're on a road with guardrails, but, when you're up on the side of a cliff with nothing between you and a huge fall off the side, you need to be much more careful. Along with the normal race style of the cups, there are a few different modes. You can play through the cup mode yourself, or you can have a second player join in on a cup. You can also play against up to four players in a race through the courses. There's a time trial mode, where you can practice on a particular course, trying for a fastest lap or fastest time through the course. Then, there's the Battle mode, where you and three other players face off on a special "arena" course, trying to hit each other. I the battle mode, each character has three balloons around them, and each time they're hit, by a shell or other projectile, they lose a balloon. Once you lose all your balloons, you're out, and the last one alive wins. For the players who lose first though, they turn into bombs, and can drive around the course causing havoc on the people still playing. While the battle mode isn't particularly exciting by yourself, I you have a few people to play against, it's a blast. The game is, without question, a spectacular multiplayer game, facing off against friends in races or battles, projectiles flying around wildly, trying to beat everyone else out. Even by yourself, the cups are definitely a challenge, trying to finish first every time and beat everyone out. If you're just playing by yourself though, either in a cup or a time trial, the game can take on whatever pace you'd like. This is where we get back to how I opened this review. While you can certainly have high-paced races by yourself, what I always enjoyed most, is just going for a nice ride through the courses by myself. There's a bunch of things to do in each course aside from just racing. For instance, in the Royal Raceway course, off to the side of the track, is a castle. This isn't part of the race track, and if you're just trying to race it'll just be something you see off to the side of the road. If you take time to drive off and look at it though, it's the entire castle courtyard area from Mario 64, complete with bridges, ponds, and everything. While there's nothing specific to do over here (it's not like you can go into the castle and start playing another game or something), it's fun to just drive around looking at everything. Similarly, in the desert level, there's a train going around the course. You have to drive over the tracks twice each time around, and, if the train is coming when you try to cross, you have to slow down and wait for it to pass. If you aren't in a rush, however, you can take a side trip and race the train, follow it through a tunnel, whatever. 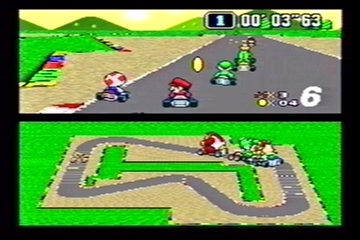 This, to me, is always what made Mario Kart 64 stand apart from other games, even other Mario Kart games. Again, it shouldn't be missed that it's a spectacular game of racing and action, either alone or with friends. To me, though, Mario Kart 64 has always been about how full a game it is, all the details off to the side of the track, or just enjoying the course itself. A nice, calm ride by yourself through Rainbow Road, just looking at the surroundings, is a very nice experience. That's what makes the game stand apart to me, is that it's a fun game to play, even when you don't really feel like racing. That it's fun to just mess around, drive into cows, play with penguins, and everything else there is to do. There's just so much here, that it's always a joy to come back and play. To get back to the actual game however, again, all of this tangential stuff shouldn't obscure what a spectacular game this is at what it really does. The cups are challenging, the battle modes are fun, some of the courses can be very difficult, and trying to best your own personal times always gives you something to aim for. Even when you're really trying to race, the game will keep pulling you back because, amid all this rambling about the other stuff one can do and enjoy in this game, it's still a challenging and fun game of racing. Even if you're normally not too big on racing games, you still should at least check this game out, and, if you like racing games, and especially if you like other Mario Kart games, this is a game that you absolutely shouldn't pass up.